You all are familiar with this cat, right? The black and white one. The black one is just a cuddling opportunist. Well. That is Oreo and she is Quinn's cat. Quinn is super obsessed with Oreo. 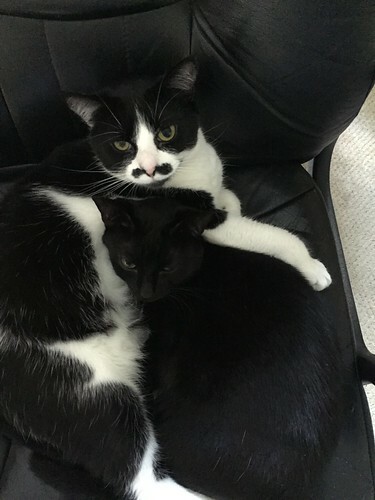 Oreo is pretty obsessed with Quinn too, so it works out. I'll put it this way: If you've met Quinn, you've heard about Oreo. No exceptions. 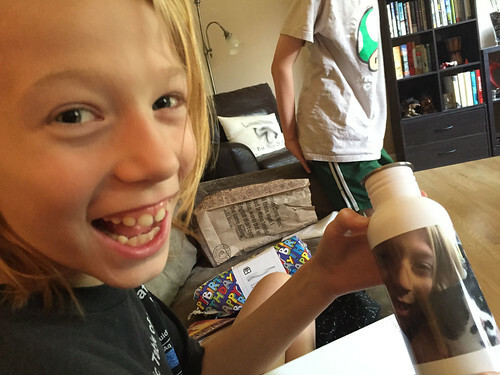 Today Quinn turned 10 and his gifts were rife with Oreo references. Look at his face. SO happy. I mean, he was also really happy that I got him a DustBuster, so the bar is maybe not too high, but you know what I mean, right? Let’s brush aside the fact that Sam is so tall that he didn’t make it into this photo. That, incidentally, is also the face I made when I saw the thing. It is SO good. Seriously. It is just so damn good. Then Sam grabbed Oreo and she was all, "What is happening? Help!" 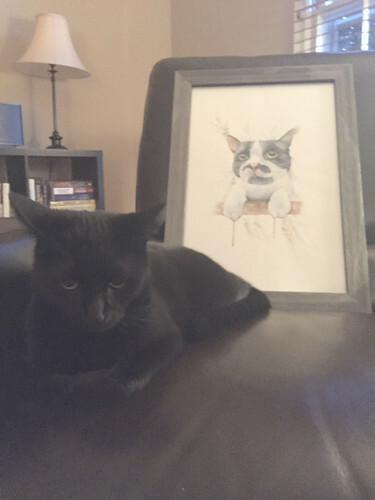 In case you're wondering, I got the art from the Pet Art Gallery on Etsy. I contacted the artist, who is in the United Kingdom, on May 5. 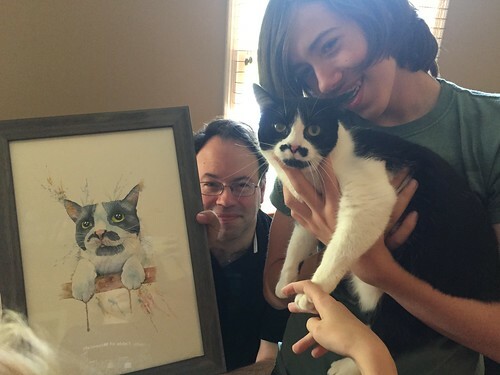 She painted the thing, submitted it to me for approval, and shipped it so that it arrived on May 20, two days before Quinn's birthday. I cannot recommend her enough. There is a lot of jealousy amongst the other members of Team Stimey Junior. I have a feeling that I have some great Christmas presents already lined up for two of them. Which is good, because someone seems a little surly that she wasn’t selected for a portrait. Oh my, that face! That happy, happy face! He's adorable. The painting is so fantastic. Happy birthday, Quinn! Jack has a May birthday, too, I seem to remember. Honor just to be nominated, HER PAW. 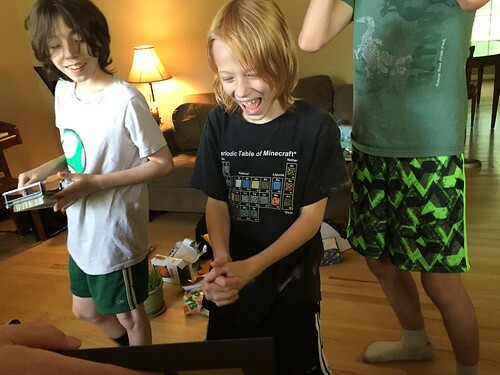 I hope Quinn had a wonderful birthday. It certainly looks like he did, I love his smile! 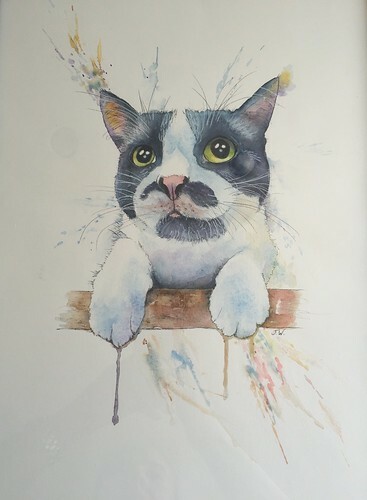 Jan Wearmouth, Pet Art Gallery. i love so many things about this. most of all, that it does what your family does - honors and celebrates each and every one of you for exactly who you are. it's delicious.